We hypothesize that type 1 VHF radar echoes can only be observed when the electrojet plasma is linearly unstable at half the radar wavelength and that further, for reasons not yet understood, the phase velocity of the unstable waves always corresponds to the threshold conditions for instability, even when the destabilizing forces (electron drift and plasma density gradient) exceed the threshold. This phase velocity, which produces the Doppler shift of the radar echoes, is usually close to the ion acoustic velocity of the medium but can differ from it to some extent because of the effect of the density gradient. This difference can be positive or negative, is proportional to λ², and can be substantial at night, when the vertical density gradients in the equatorial E region are large and variable. Nighttime equatorial radar observations do seem to indicate considerable variability in the type 1 velocity. These effects may also be important in explaining auroral radar observations. 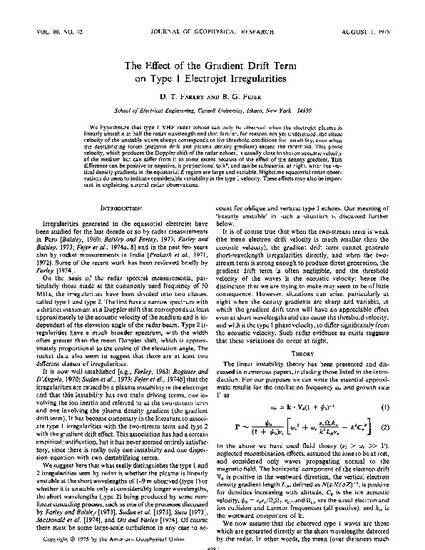 Farley, D. T., and B. G. Fejer, The effect of the gradient-drift term on type I electrojet irregularities, J. Geophys. Res., 80, 3087, 1975.